International Sunflower Guerrilla Gardening Day is an annual event held on May 1. It was created by a group of guerrilla gardeners from Brussels in 2007. The term “guerrilla gardening” is applied to gardening on land that the gardeners have no legal rights to utilize. Guerrilla gardeners may have different motivations, but most often they garden on abandoned or neglected land in order to make the site of use and/or more aesthetically attractive. The guerrilla gardening movement is believed to have emerged in the United States in the 1970s. Over the decades, it has spread throughout the world. There are groups and associations of guerrilla gardeners in many European, Asian, and American countries. 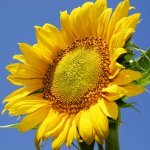 On International Sunflower Guerrilla Gardening Day, participants are encouraged to plant sunflowers in their neighborhoods. In the parts of the world where the weather in May is too cold to plant sunflowers, people may plant other plants appropriate for the season. On the occasion, GuerrillaGardening.org headquarters distribute free sunflower seeds for guerrilla gardening. Those who intend to participate in the event should make a request in advance in order to receive free seeds.